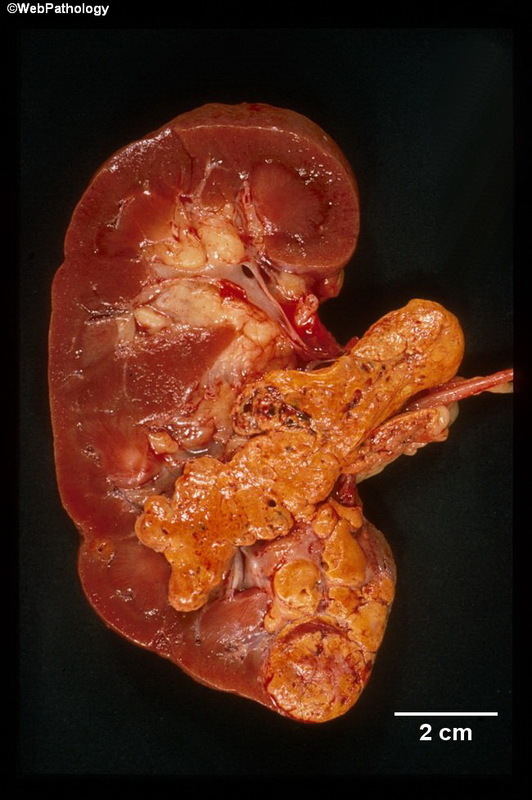 This fresh bivalved nephrectomy specimen reveals the multiple golden-yellow tumor nodules with invasion of the renal vein, an adverse prognostic indicator. Vast majority of renal cell carcinomas greater than 7 cm in size show invasion of renal vein or fat in the renal sinus. There are several clinical syndromes which may be complicated by the development of renal cell carcinoma, including von Hippel-Lindau disease, acquired cystic disease, autosomal dominant polycystic kidney disease, multilocular cystic nephroma, tuberous sclerosis, children treated for neuroblastoma, and hereditary leiomyomatosis and renal cell carcinoma syndrome.